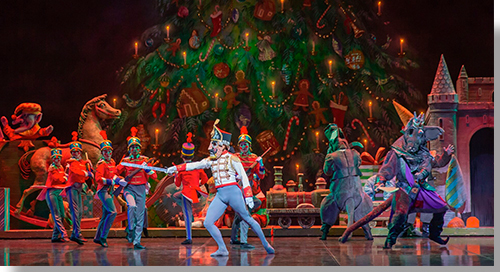 The Colorado Ballet's 58th annual production of this holiday classic shows once again why it is consistently rated one of the best in the country, with the company's deep talent evident throughout. On opening night, Emily Speed (Clara) and Ariel Breitman (Nutcracker Prince) reprised their stellar 2017 debuts, taking their simpatico to a new level. Their pas de deux are elegant; the lifts easy and clean; and their energy celebratory. A special delight was seeing Dana Benton, who in previous years had danced the role of Clara with the company, now as the Sugarplum Fairy, adding a real life aspect to the backstory of a girl's coming of age, and the fulfillment of her dreams, as orchestrated by her godfather, Herr Drosselmeyer (Gregory K. Gonzales). 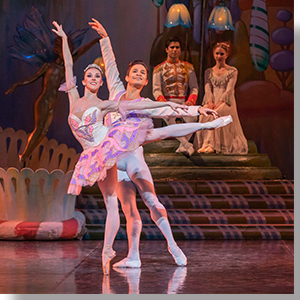 Benton brings a sweet, light touch to the Sugarplum Fairy's regal stature, as she and her Cavalier (a charming Yosvani Ramos) put on a dazzling show of classical virtuosity in their pas de deux and attendant solos. Gonzales continues to enthrall us as Drossmeyer, with his sublime pantomime, grandiose gestures, and absent-mined professor forgetfullness (Which direction was I going? ... Oops! Forgot my hat! ), which makes the magician both a master of mysterious, dark forces and humorous vehicle for good works. Drosselmeyer's conjuring of the Columbine doll and the Soldier doll amaze adults and children alike at the Stahlbaum's party, and his enlargement of the Christmas tree is another stunner, but his repair of both the toy Nutcracker and his raising of the Nutcracker Prince from the dead give pause regarding the psychological insights (81 years before Freud's The Interpretation of Dreams) of E.T.A. Hoffmann's story, The Nutcracker and the Mouse King, by way of Alexander Dumas' adapted story, The Nutcracker. 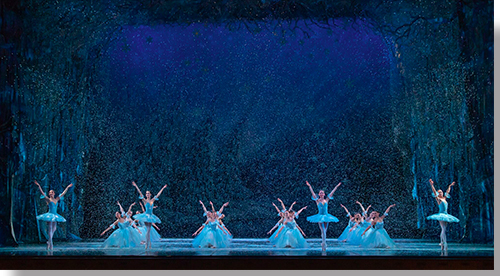 The first act ends with beautiful work by the ensemble (16 dancers) as the Snowflakes and the Crystals (4 dancers), as snow begins to fall and slowly builds into a near blizzard, topped off by Clara and the Nutcracker Prince flying away on a sleigh to the Land of Sweets. Mother Ginger and her children (Polichinelles)—a happy showcase for the Colorado Ballet Academy and hilarious dance moves from the colossal, matriarchic red-head. The delights of the Land of Sweets are capped off by Dew Drop (Asuka Sasaki) and the Flowers that carries a metaphor of the breathtaking displays of a spring meadow abloom. Sasaki's grace highlights this wonderful set of dances. Finally, the Sugarplum Fairy and the Cavalier perform a stunning pas de deux followed by Clara and the Nutcracker Prince with their own fireworks, leading to good-byes from each of the divertissements, before we are brought back to Clara awakening from her dream, as Drosselmeyer orchestrates in the background. Music Director & Principal Conductor Adam Flatt and the Colorado Ballet Orchestra perform wonders with Tchaikovsky's immortal score. The Colorado Ballet's presentation of The Nutcracker, based on choreography by Martin Fredmann, with additional choreography by Sandra Brown, and staged by Sandra Brown, Lorita Travaglia, and Maria Mosina runs through December 24th. For tickets: http://tickets.coloradoballet.org.